hiya my name is kaye i recently became the owner of harry my senegal parrot. Hes not had the best start to life i actually met him when i went to buy someones sofas and in the corner of the living room was harry in a very small cage with no toys and his cage was stinking, instead of offering to buy the sofa i said i will give you the money for the parrot, from what i have found out he has had quite a few homes and hes only about 12 months old so understandbly he is unsure of people will try and bite you if you try to smooth him. Since he has been with me he has changed into a lovely big cage and has lots of toys which he was very scared of wouldnt go anywhere near them but hes slowly getting use to them will give them odd pushes with his beak.! I have however had him on my lap (with a towel) hardly holding him and stroked his head and neck and he started to fall asleep and when i let him go he walked on my leg for awhile before flying off.. When im in the room he follows my every move and shows off when my partner is not in the room, its ashame hes had such a horrible start as he is a lovely boy i expect he will never bee 100% and might always have a nip in him but as long as he's happy and healthy than thats all that matters..
and diana sent me here!! Hi Kaye, pleased you found the forum. Senegals can be such fun loving birds and it`s so lovely to hear you have taken him on. It sounds like the poor fella has had a bad start but it`s amazing how, in time, they are so forgiving. Our Macaws are all rescued and our Severe Macaw Harley suffered abuse being dragged out of the cage by his neck, and then the next owner shutting him away. We`ve had Harley 3 years now and he`s very bonded to me, he has learnt to trust me and has no issues with my hands being near him now. He does nip sometimes but I think that goes for most birds, rescues or not. I`ve never kept Senegals but I have a close friend who does, well 2 actually and they are absolutely adorable. My Sennies love dunking pieces of fruit or biscuit in their drinking water! does Harry do this!!! they are doing it right now with an unsalted crisp. no havent seen him do that.. he is just chucking nuts/seeds around at the mo doesnt want to come out!! hello and welcome good for you saveing the senny i have 9 senny's and they are all full of caracter. We rescued a sennie and gave him a reason to live after his owner had died, he now has a lovely home with kasuku on here! He's still very cage bound as the original owner didn;t let him out of the cage for at least 9 years that we know of. he is with another sennie now that is the cuddiest of birds, not in the smae cage but you never know in the future what will happen! I hope Harry has found his niche in life the poor little baby! I don't know how people can be so nonchalant about birds feelings! He does sound as though he's settleing down and relaxing though doesnt he? Hello there and welcome to the forum!! thanks every1 i think hes settling nicely for the amount of time just hope theirs room for more. I cant get over what good jumpers they are he jumps everywhere in his cage with no help from his wings! diana mention a few fruit options so i got him a pomeranet (sorry im not very good at spelling) hes still picking out the apple at the moment but im sure when my back is turnt he will try it..
will put some pictures up of him later and show you all what a lovely boy he is!! well if i do say so mysef..lol..
Are you hoping to offer a home to another bird in the near future then Kaye? You never know someone on here may be able to help in due course. Really looking forward to seeing his photo. Well done you, for taking him out of an enviroment that seems just horrid!! Im sure he will come on in leaps and bounds now that he has a new secure home! Sazu loves his fruit; apples, pear, orange, grapes, bananas all go the same way.. down to the bottom of the cage to forage around with later! lol. He's nuts about..err.. nuts however! And yep, Sazu loves jumping too, they are great to watch aren't they! Looking forward to seeing photos of him! Best of luck, Im sure you both have many lovely years to look forward to! i would love to have another bird at some stage, would be nice to have one like harry who hasnt had a very good start to life. I got 2 be honest i do have a soft spot for cockatoo's always have done but will have to wait and see im in no rush, me and my partner are trying to get an outside aviary sorted think harry would love it, but to be honest we are kind of stuck on what to do and what to use.. but im sure we wil get it sorted. And harry does the whole chucking it out all ver the place then goes looking after, but he does love apple it was the 1st fruit i gave him and when i gav eit to him for the 1st time he grabbed it and chucked it but straight after was playing with his tongue, i went out into the kitchen wasnt their long and he was on his perch with that apple in his hand.. really dont think he had much or any fruit when we had him! but i can tell you from the bird i met at the girls house hes changed alot, even my mum who isnt fond of birds has said he looks perkier which and bigger she reckons, but the cage he is in is huge so maybe thats why!? i have a few that prefare there food wet so dip it in the water just like we dip our bisciuts in tea. i have some pics but they wont load on 2 here can anyone help ?? im not very good with stuff like this..lol..
have you got photobucket if so cut and paste the image off there. Photobucket is a free website www.photobucket.com You can then upload your photos on to here, it should tell you how to do it. Then you can select the one you want to put on here by clicking under the photo on img code that will hold it for copy. Come onto this forum then click paste, and then send - fingers crossed it works!! Harry sounds like a very happy bird now! It also sounds like he's come on loads since he's been with you. I'm owned by a sennie too, he's got a lot of, ahem, I suppose you could call it character, but most call it anger management issues but he loves me, which is fine most of the time! Welcome to the forum, it's a great place to be. Harry sounds far nicer than any sofa , so glad you chose him to bring home and look forward to hearing all about him in the future. i will give the photo bucket a go in the morning! im really not very good with things like this..lol. might have to get the other half to look!! 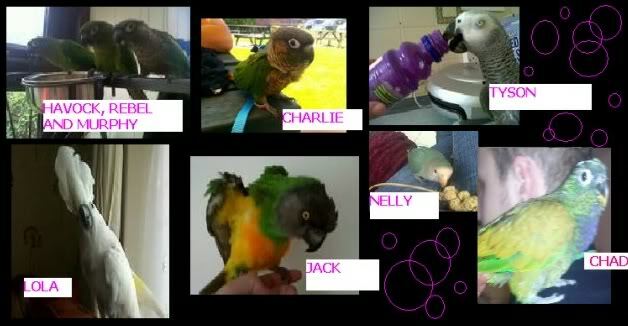 harry definately has character hes been a very vocal and active bird 2 day jumping around his cage, climbin all around very werid?! but it was the kids 1st day bk in skool and the 1st time hes seen us do it, wonder if thats y?? also hes got an corner cage which we have put on a wall bit in our living room so the floor of his cage is level with the sofa and i always sit in the same place right by the cage hes been coming dwn 2 the floor right by the side of me but if i look at him he quickly moves away..
yes i think he was a much beta purchase than ne sofa..lol..
gonna spoil him 2 some more toys tomorrow thinking i mite get some u can hide treats and stuff in and c how he gets on and i have noticed he does not like his reflection.. or is that normal?? How is Harry getting on?